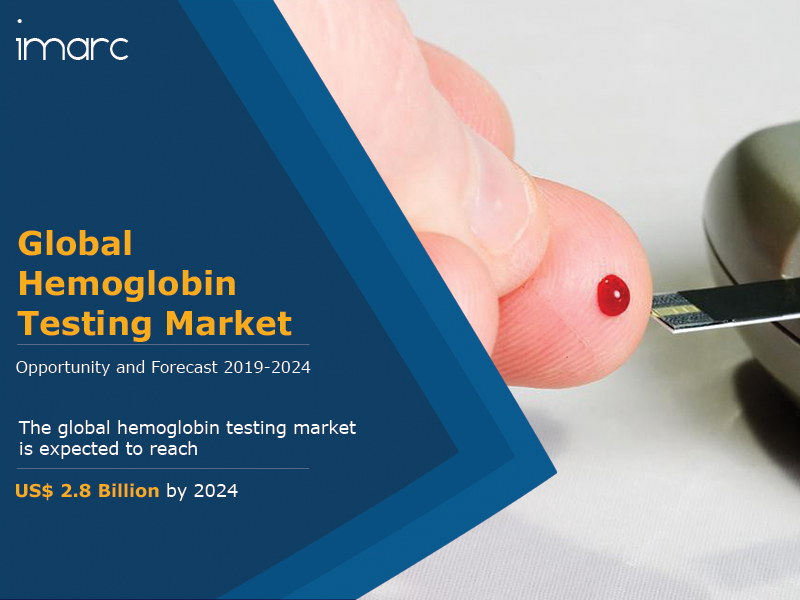 The global hemoglobin testing market was worth US$ 1.7 Billion in 2018. A hemoglobin test measures the count of red blood cells (RBC) or the level of hemoglobin in the blood. Hemoglobin is a type of protein present in the RBCs that carries oxygen to the organs and transports carbon dioxide back to the lungs. Hemoglobin tests are used extensively by doctors as a part of their routine check-ups or to diagnose a serious medical condition in the patient. If a test reveals that the hemoglobin level in an individual’s body is lower than normal, it means that they have a low RBC count and are prone to disorders such as anemia. If the RBC count is higher than normal, it could be an indication for a blood disorder or can be caused by living at a high altitude, smoking and dehydration. The key end users of hemoglobin testing market are medical laboratories, hospitals and research centers. An increasing prevalence of chronic disorders such as anemia and diabetes represent a key factor driving the global hemoglobulin testing market. In 2018, an estimated 490 Million people around the world suffered from diabetes. The prevalence of diabetes is currently being catalysed by an increasing ageing population, poor dietary habits, sedentary lifestyles and rising levels of obesity. Patients suffering from diabetes need to undergo tests to measure blood glucose and HbA1c levels regularly, driving the demand for such tests. Moreover, factors such as favourable reimbursement of hemoglobin testing under various health insurance policies is also catalyzing the growth of the market. However, in many countries, medical insurance doesn’t fully reimburse the cost of hemoglobin testing, but with partial payment and other coverages, consumers are increasingly adopting regular and periodic tests in order to check and maintain their overall health. Furthermore, factors such as improving health infrastructure, increasing per capita expenditure on health care, rising awareness for blood-related ailments, ageing population, technological advancements, etc. are also projected to drive the global hemoglobin testing market in the coming years. Looking forward, IMARC Group expects the market to reach a value of US$ 2.8 Billion by 2024, registering a CAGR of 8.5% during 2019-2024. How has the global hemoglobin testing market performed so far and how will it perform in the coming years? What are the key regional markets in the global hemoglobin testing industry? What are the various stages in the value chain of the global hemoglobin testing industry? What are the key driving factors and challenges in the global hemoglobin testing industry? What is the structure of the global hemoglobin testing industry and who are the key players? What is the degree of competition in the global hemoglobin testing industry? What are the profit margins in the global hemoglobin testing industry?